The legendary Stevie Wonder is set to play Dublin's 3Arena this summer. 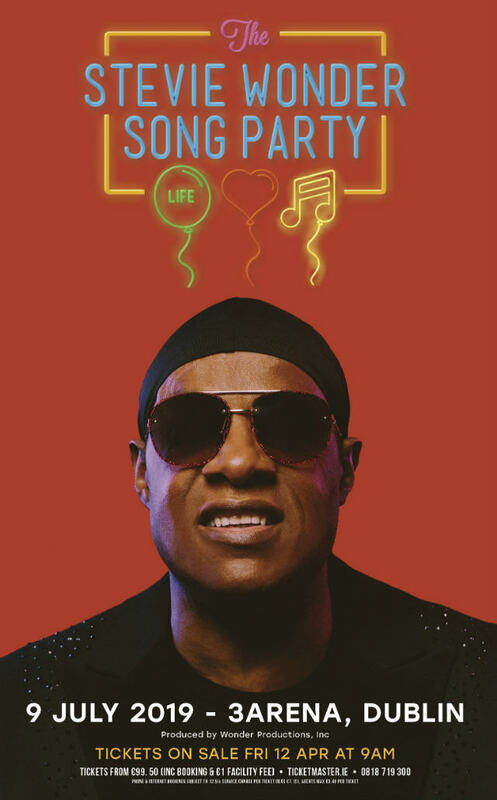 "The Stevie Wonder Song Party: A Celebration of Life, Love, & Music" is set to hit Dublin's 3Arena on Tuesday, July 9th. Tickets start from €99.50 including booking and facility fees, and will go on sale this Friday, April 12th at 9am from usual outlets. The youngest recording artist to have achieved a #1 single at the age of 12, Stevie Wonder is one of the most celebrated and prominent figures in popular music. To date he has amassed 49 Top Forty singles, 32 #1 singles and worldwide sales of over 100 million units. Not only that, but he's won 25 Grammy Awards, the Grammy Lifetime Achievement Award, a Golden Globe, and an Academy Award. Not forgetting his role as an activist also, he spearheaded Martin Luther King Day as a national holiday in the USA. Wonder's latest album 'A Time To Love' was released in 2005. Here's the title track from the album, featuring Paul McCartney on guitar.